Publisher: Museum Press Limited, 1955. Hard Cover, 196 pages, 5.25 x 7.50. 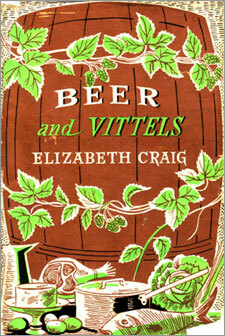 Here is one of the most interesting and colorful of the 1950s-era beer cookbooks, this one published in London. As the author writes in her Introduction, the subject of beer and food had been largely ignored in England up to this time (a fact which her book was meant to correct): "If there is one form of cookery that has been neglected more than another in Britain it is beer cookery. You have to go abroad to find housewives cooking freely with beer, and taking trouble about what they serve with it. There are plenty of books telling you how to introduce wine to fare, but few extolling the flavour of beer; plenty of inns serving excellent beer, but not enough taking pains with its accompaniments; plenty of cocktail parties all the year round, but how few beer parties! And yet beer parties can be exciting." The book offers advice on beer/food pairings, how to throw a beer party, and a few "Hints on Beer" (such as washing your face in beer, as did the Gauls, "who had brilliant complexions"). But the bulk of the book, and its real value, is the section entitled "Beer In The Kitchen," which contains dozens and dozens of recipes for cooking with beer -- everything from soup to nuts, literally. Recipes include Boiled Lobster with Beer Sauce, Fillets of Trout in Beer, Meatless Beer Gravy, Sweet Potatoes on the Beer, Beer Dressing for Root Salads, Cabbage Salad with Beer Mayonnaise, Beer Drops (a mincemeat and beer biscuit), Beer Fruit Loaf, Chocolate Beer Layer Cake, Beer Cheese, any many, many others.